Archaeologists are hoping to discover who was buried in a 14th century stone coffin found near the final resting place of Richard III. 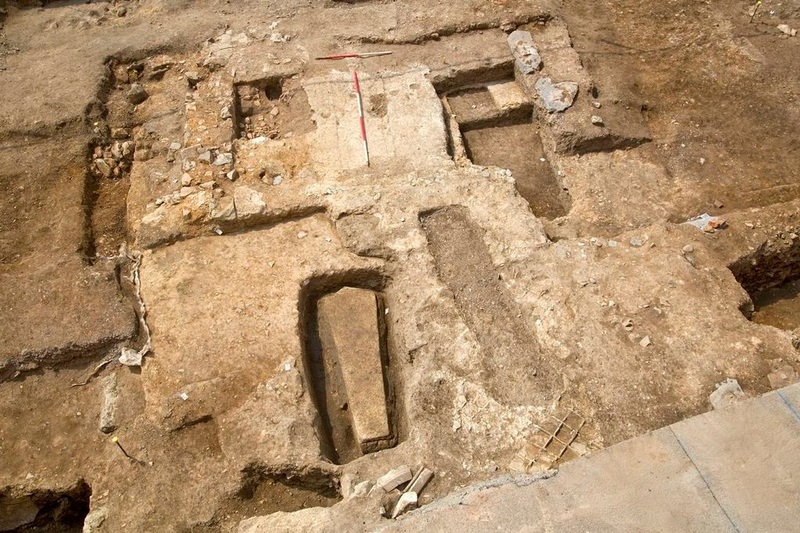 The University of Leicester team will lift the lid on the lead-lined coffin at some stage this week – the final week of their second dig at the Grey Friars site. The dig team suspect the coffin may contain a medieval knight or one of two high-ranking Franciscans at the friary. Now, the team are carrying out their second excavation of the Grey Friars church – and are hoping to examine the stone coffin in the final week of the dig. The coffin is the first fully intact stone coffin found in Leicester, and is likely to contain a high-status burial – though we don’t currently know who is buried within. The team suspect the coffin was buried in the 14th century – more than 100 years before Richard III was killed at the Battle of Bosworth and buried at the friary. Grey Friars site director Mathew Morris, of the University of Leicester Archaeological Services (ULAS), said: “Stone coffins are unusual in Leicester – and this is the first time we have found a fully intact stone coffin during all our excavations of medieval sites in the city. I am excited that it appears to be intact. “We plan to get a plan of the coffin by measuring it and taking photos. Then we will lift the lid up to see what is inside.